Ronan O'Neill grabbed a sensational stoppage-time goal to give Omagh their first Tyrone SFC title since 1988 as they beat Carrickmore 1-10 to 0-12. 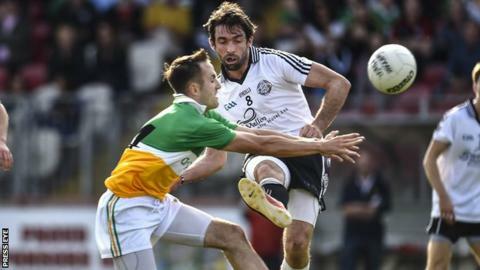 Martin Penrose's fifth point appeared to have given Carrickmore a record 15th title before Omagh's late goal. Cushendall won the Antrim Hurling title with a 1-15 to 1-5 win over St Gall's. Slaughtneil snatched a 2-11 to 2-9 win over Kevin Lynch's in the Derry SHC final while Portaferry beat Ballycran 1-12 to 1-11 in the Down SHC final. Carrickmore have now lost four finals since their last O'Neill Cup triumph in 2005, and there could not have been a more cruel manner to allow this one to slip from their grasp. They led for most of a tight game that was level on seven occasions, and despite playing the final quarter with 14 men after Johnny Munroe received a second yellow card, the trophy seemed to be theirs, in front of a crowd of around 10,000 at Healy Park. Carrickmore led by 0-8 to 0-6 at the halfway stage, with Penrose, Paul McAleer, Mickey Donaghy and Ruairi Loughran all kicking points. They had goal chances either side of half-time, Niall Loughran's fisted effort deflected on to a post by Joe McMahon, before Ryan Clarke saved superbly from Donaghy. There was a similarly dramatic finish in the Derry Hurling final at Owenbeg as late goals from Se McGuigan and Gareth O'Kane earned the holders a two-point victory. A Niall Ferris goal had helped the Dungiven outfit lead 1-6 to 0-4 at half-time and while Slaughtneil fought back to trail by only one, Kevin Lynch's looked in control when Mark Craig struck their second goal to put them five ahead with less than 10 minutes left. But Slaughtneil outscored Lynch's 2-2 to 0-1 during the remainder of the game as McGuigan and O'Kane both fired to the net in a two-minute period after high balls into the Kevin Lynch's defence. The Antrim Hurling final was a more clear-cut affair as Neil McManus's early goal helped favourites Cushendall earn a 10-point victory over St Gall's. Cushendall, who had defeated Dunloy and former All-Ireland champions Loughgiel on their way to the decider, led 1-3 to 0-0 before Anto Healy opened the St Gall's account on 24 minutes. St Gall's briefly appeared to be back in the game when Conor Burke netted two minutes later but Cushendall regrouped to lead 1-6 to 1-1 at half-time. CJ McGourty notched the first score of the second half for St Gall's but Cushendall dominated the remainder of the contest as they took a 1-15 to 1-5 success which earned the Ruairi Ogs outfit a 12th Antrim senior title.